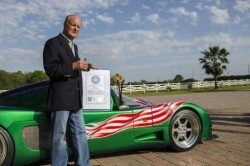 The Maxximus LNG 2000, the brainchild of financier Bruce McMahan has been named winner of Car of the Year 2012 Award by the World Record Academy (WRA), the world’s largest organization which verify & certify world records. The natural gas vehicle has been recognized for its overall balance and the outstanding achievements in speed, fuel efficiency, dynamics and originality. At a time when oil prices were soaring, Dr. McMahan conceived a strategy of utilizing America’s highly abundant yet untapped fossil fuel, natural gas. “We have this fuel in abundance throughout the United States. We should focus on developing the infrastructure, create jobs, and decrease our dependence on foreign fuel sources,” Dr. Bruce McMahan says. Centaur Performance Group, the incubator group that researched and brought these technological monster advancements in the green automotive sector, unveiled the Maxximus LNG 2000 in 2011 at the Wynn Hotel in Las Vegas, NV. Director Jeff McMahan states “The multiple records which the Maxximus LNG 2000 holds reflects years of hard work and effort. Without my father’s vision and leadership, none of this would have been attainable.” The vehicle set a world record for LNG (liquefied natural gas) in January 2012 with an outstanding 0 – 60 mph (0 – 97 kph) in just 1.96 seconds. Dr. McMahan takes great pride in his accomplishments with the Maxximus LNG 2000. “America should reduce its dependency on foreign energy while stimulating America’s economy by focusing on our own untapped resources,” he said.